All in all, it has been a good week for government in Canada. Ontario is finally on the road to sane, if not elegant and stylish, government. The new administration will be psychologically capable of emancipating the province and its hydroelectric system from the credulous and insidious champions of energy at maximum cost from fear of the climate bogeyman that possessed the outgoing regime like a satanic force in a nightmare. The response would have been rational if the danger had been imminent, or even real; but scores of billions of dollars have been spent or committed that are just scandalous profligacy. The new government will cut costs and taxes fearlessly and most Ontarians will be the better for it. It was also the best week Justin Trudeau has had. 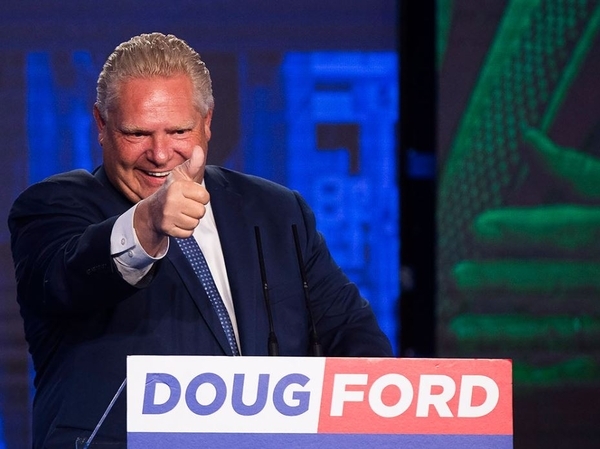 He finally intervened in the Kinder Morgan pipeline debacle (largely his own creation), and in taking over the project, there seems to be general agreement that he got a pretty good bargain for the taxpayer. This could revive the high tradition of public- and private-sector co-operation that largely founded and built Canada. This was the formula that Jean Talon employed in the late 17th century to set up Canada's brewing, iron, textile and shipbuilding industries, that John A. Macdonald employed in building the Canadian Pacific Railway, Wilfrid Laurier and Clifford Sifton in attracting the immigrants who populated the West, C.D. Howe applied in the war effort, and in building the TransCanada Pipeline, and even Pierre Trudeau employed at Petro-Canada. If Justin Trudeau bangs provincial heads together and faces down the more egregious native leaders and actually builds the line and emancipates Alberta's suffering oil industry from extortion and oppression, he will score a solid victory for Canada and himself. While he is at it, he should build the Energy East pipeline and end this country's nonsensical importation of oil from politically disreputable countries while our domestic production surplus languishes underpriced or unsold in Alberta. If, instead of decisive action, the federal government enters a new and fruitless era of dithering and moral intimidation by native extremists and eco-lunatics, this initiative in public ownership will be a disaster. The issue of trade with the United States is very complicated. Only trade wonks and those familiar with the detailed negotiations could judge if American impatience with Canada is justified. It is understandable that the Trump administration is exasperated by the conduct of Mexico, which has enjoyed a $65-billion annual trade surplus with the U.S. while facilitating the flow of up to 500,000 illegal migrants into the United States annually, almost all of them unskilled, and failing to deal effectively with the entry into the united States of immensely dangerous quantities of illegal drugs, especially opioids. This has been happening as Mexico has enticed American companies to close their factories and dismiss their American workforces, move just across the Mexican border to take advantage of low wages and taxes, and not to remit to the U.S. the increased profits they make from exporting goods and unemployment back into the United States; and to re-enlist the profits in Mexico. You can't blame Mexico for taking all it can get. But nor can you blame the United States for refusing to tolerate it any longer. Canada is essentially a fair-trading country and it should be possible to work this out without excessive abrasions. Justin Trudeau struck a good note with American television news viewers by saying how offensive it was that Canada was being commercially penalized under national security legislation, as if Canada threatened American security. Of course that is not what the recourse to that statute actually implies, but it was good spin. Some Canadian government spokesmen were inadvisedly belligerent, threatening step-by-step escalation as far as necessary to bring Washington to its senses. The objective facts are that the United States could produce almost everything required for its domestic needs, as it did during the Second World War, after a brief transitional period. That is not the case with Canada and we have only one land neighbour, and despite all our good works in the world as Dudley Do-Right the red-tunicked peacekeeper, no sane person should invest much trust in the rest of the world doing us any favours. The United States has an $865-billion trade deficit and it is going to reduce it drastically and has the ability to do so — it is already happening in the case of the biggest component, oil imports. There isn't a deficit with Canada if financial services are included and we should be able to settle this down with neither embarrassment nor pugnacious histrionics. But a real trade argument with the United States would be very hazardous, as our exports to the U.S. are over 20 per cent of our GDP, and theirs to Canada are only two per cent of U.S. GDP. America now has more jobs open than it has unemployed and is posting 4.8 per cent economic growth this quarter, about two-and-a-half times the Canadian level. Most of the American jobs dependent on exports to Canada are not in states won by President Trump, where the administration may not be as sensitive as in solid Republican states. There have been suggestions of solidarity with the EU and China, who really have been shafting America provocatively in some ways, and deserve to be sharply rebuffed. We should not get into that fracas, where the Americans have the high cards and some countries are going to take some pain. The most asinine suggestion was Scott Gilmore's in Maclean's (the husband of my friend but in energy matters, misguided, Catherine McKenna, federal environment minister). He advocated the countries recently hit by the U.S. in trade matters join for a counter-Magnitsky Act and impose individual boycotts on Americans deemed responsible for unfair trade practices. (The American Magnitsky Act targets those deemed responsible or complicit in the death in captivity of Sergei Magnitsky, a crusader against Russian government corruption.) That would lead to the end of practically all exports to the U.S. by those countries, and the end of the Western Alliance. All the slackers who have happily granted the United States the right to defend them without paying their own way, like Canada, would have the pleasure of going it alone. There are many more people employed elsewhere serving the market for U.S. imports than there are Americans working in export industries. This is an argument the United States can't lose and those who have become addicted to picking that country's pockets are just going to have to seek rehabilitation like other junkies after a cold-turkey break from the habit. The most agreeable governmental outcome of the week was the triumph of Joe Groia at the Supreme Court. Some readers may remember my writing about this case several years ago. Groia, former director of enforcement at the Ontario Securities Commission (in days when it was still a half-serious operation), successfully defended in the Felderhof case. This was the tokenistic prosecution of a junior officer of the ill-fated Bre-X Corporation. He gained an acquittal in an abrasive trial, and his conduct, though criticized by the trial judge, was deemed to be acceptable. The Law Society of Upper Canada however, as it torqued up its professional requirement for championship of inclusivity and diversity and other authoritarian leftist nostrums, charged Groia with incivility and fined and suspended him. My friend and sometime counsel, distinguished barrister Earl Cherniak QC, fought this case through the Law Society's internal kangaroo court and kangaroo appeal court and then through the law courts all the way to victory, 6-3, in the Supreme Court of Canada. Given the cause and the circumstances, Earl Cherniak underbilled his client (a commendable policy I wish he had adopted when he also successfully represented me). It is a magnificent victory for both of them. In the midst of the struggle, Joe Groia was elected by his professional colleagues as a bencher of the Law Society, which indicates what an abusive little fiefdom the Law Society officials have been running for themselves. Maybe the incoming Ontario government will spruce up the concept of professional self-regulation; this is one area that could stand some state interference in the public interest. Last week, Canada's democratic system was working well, not least in comparison with the United States, where most of the former heads of the justice department, the FBI, the major intelligence agencies and the last unsuccessful presidential candidate and her entourage are all entering the grey zone of indictability and possible conviction. It is a tawdry and absorbing spectacle, but it isn't peace, order, and good government.